New Delhi:- According to a written press release issued by the Delhi Sikh Gurdwara Prabhandak Committee (DSGMC) Congress party leader Sajjan Kumar was identified in a trial court in Delhi by a November 1984 Sikh Genocide victim as the one who had instigated a mob to kill Sikhs during the genocide that broke out after the assassination of then prime minister Indira Gandhi. 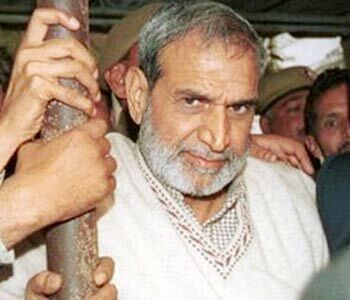 Deposing as a prosecution witness, Sheela Kaur told the court that she had seen Sajjan Kumar addressing the crowd that Sikhs had killed “our mother” (Indira Gandhi) and then instigated the mob to kill them. sajjan“On November 1, 1984, I do not remember the time, I heard a noise outside my house. I came out of the house and saw a huge crowd collected in the park opposite my house. I saw Sajjan Kumar addressing the crowd that Sikhs have killed our mother. The crowd started raising slogans. He then continued to say kill everyone, burn their houses. I ran inside my house. The crowd rushed to my house carrying lathis…,“ Kaur deposed before district judge Kamlesh Kumar. She told the mob had killed three of her family members–husband Balbir Singh, father-in-law Basant Singh and brother-in-law Balihar Singh–after dragging them out.She said 49 people were killed in her street. Her cross-examination remained inconclusive and would continue on September 17, the next date of hearing.